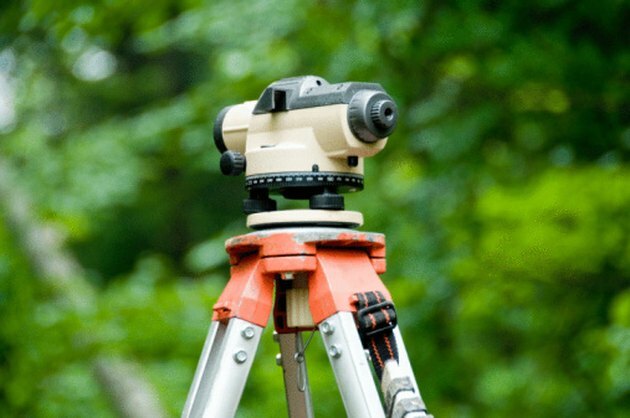 A transit level is an optical tool mounted on a tripod along with a built-in level. It allows the user to determine the position of points, lines, and objects. You can use a transit level in making maps and plans and in construction projects. The transit level gives you precise measurements in true horizontal, degrees, minutes, and seconds. Like every type of measuring device, these need to be recalibrated in order to maintain accurate readings. With not much work all, you can recalibrate easily. Preview the transit level to ensure it has no damaged or broken parts. Turn the thumb screws on the transit level to adjust the level vials to center. Use the tape measure to place a measurement rod in the ground 100 feet away from the transit level on two opposite sides. Take a reading of the first measurement rod and record the distance. Confirm that it measures at 100 feet. Repeat the same process above for the other measurement rod. Look at the two readings you have taken. If they are identical, you have calibrated the transit level. If not, adjust the level vials listed in step 2 half the difference in the readings, then repeat the measurements. Continue this until the readings are equal. Based in Boston, Dora Acosta has been writing since 2007. Her articles have appeared in "Watermark" magazine, "MassMedia" newspaper and "Human Architecture" magazine. Acosta received the American Scholars Award in 2008. She holds a Bachelor of Arts in English and criminal justice from the University of Massachusetts Boston and a Master of Arts in education. She works as an English Language Arts Teacher in Cambridge, Mass.